National Forest Week—established circa 1920 as Forest Fire Prevention Week—wraps up with an array of awards. SFI’s President’s Award went to Craig Blair of Resource Management Service, J.D. Irving was the recipient of SFI’s Conservation Award, and Maine’s Implementation Committee was the winner of the SFI’s Achievement Award. ECOSYNTHETIX won the Bio-Based Chemical Innovation award, ECO Canada’s Impact Award for auditors went to Chis Mosher and the City of Quesnel and Cariboo Regional District were recognized for their use of wood in construction. Related stories include a feature on the future of Canada’s forests (by Kathy Abusow) and a logging demonstration for 300 students in Port Alberni. Elsewhere, BC Interior politicians call for prescribed burns to deal with wildfire and Senators Jon Tester, D-Mont., and Steve Daines, R-Mont., testify in support of Senate Bill 605 – Litigation Relief for Forest Management Projects Act. 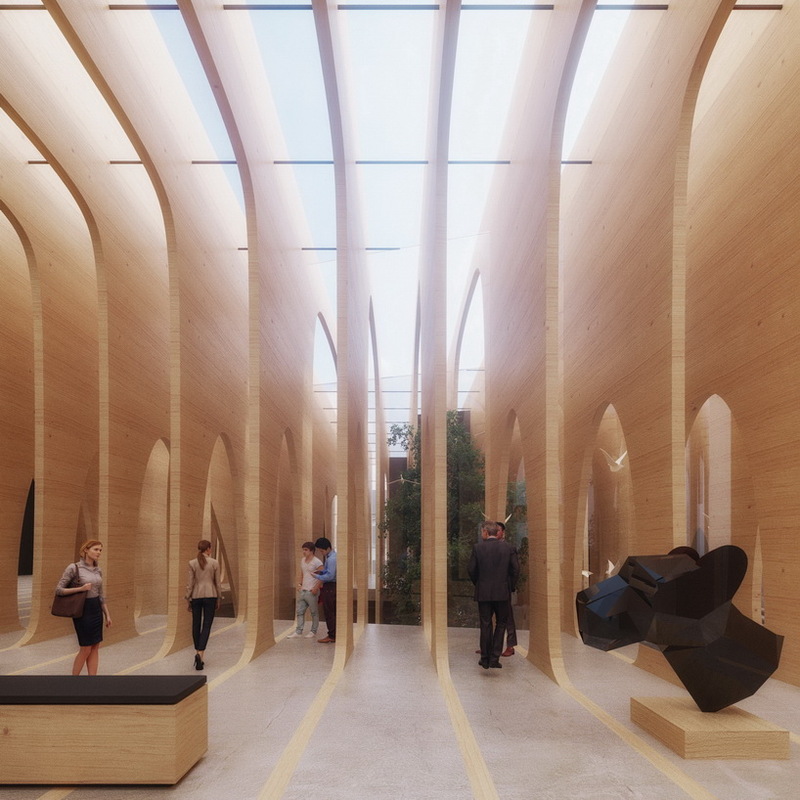 Finally, some United Arab Emirates University students seek to make paper from sand and a design proposal for Tampere’s new museum in Finland—with its giant wooden blades—is mind-blowing. Have a look. A project by the students at the United Arab Emirates University (UAEU) in Al Ain aims to produce paper without wood pulp, using instead sand and pellets of a polymer, a material made from repeated chemical units joined together. Their method could offer environmental benefits, since it requires less energy than traditional paper production from wood pulp. It also does not need water, an advantage in countries such as the UAE that face severe demands on their water resources, and in turn it does not generate waste water. The Trump administration took a hard line on shrinking the U.S. trade deficit with Canada and Mexico as the third round of negotiations on rewriting the North American free-trade agreement concluded in Ottawa on Wednesday with little substantive progress. Washington’s unshakeable focus on reducing its trade deficit in the NAFTA talks was immediately challenged by Foreign Affairs Minister Chrystia Freeland. Ms. Freeland would not say whether the U.S. stand on trade deficits and protectionist measures against aircraft manufacturer Bombardier Inc. and Canadian softwood lumber are signs the Americans want to dissolve NAFTA, as Donald Trump vowed to do during his presidential election campaign. …”I do not have the superpower that allows me to look into the heart of a counterparty and divine their true intention,” Ms. Freeland told reporters when asked if the United States is serious about negotiating a new deal. WOOD MARKETS is now FEA-Canada – A New Era Begins! In 1993, I formed a company — R.E. Taylor & Associates Ltd. — based on my fifteen years of experience in forestry and wood products, and five years of domestic and international consulting work. Over time, the company became recognized internationally as one of the leading publishers of ground-breaking wood products analysis, research and forecasts. …In 2005, the company was rebranded as International WOOD MARKETS Group Inc. …We are now embarking on a new chapter! effective august 2017, forest economic advisors llc (fea) is the new owner of international Wood markets Group. The acquisition provides FEA with a deeper understanding of key trends in Canada, along with exposure to the comprehensive international business developed by the WOOD MARKETS team. Georgia — Irving Consumer Products held a barbecue Thursday for first responders for their efforts during and after Tropical Storm Irma. 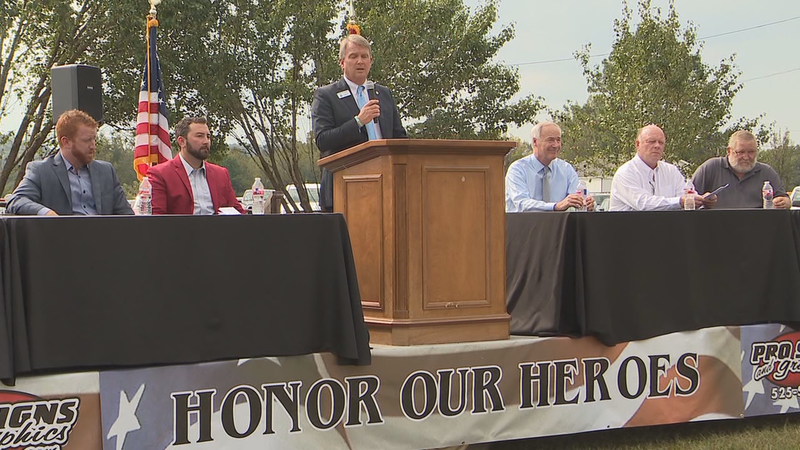 Irving also held a groundbreaking Thursday for a $400 million Macon-Bibb County manufacturing plant. …Fans were blowing and a tent was set up to counter the sweltering heat Thursday at the future site of a $400 million manufacturing plant in south Bibb County. It was a stark difference from about nine months ago, when gas heaters were needed as Macon-Bibb County Industrial Authority leaders courted Irving Consumer Products executives about building a state-of-the-art facility here. …Construction will start soon on the 700,000-square-foot plant, where soft bath tissue and paper towels will be made. The Canada-based company expects to have about 200 employees working at the facility when it opens in 2019. The City of Quesnel and Cariboo Regional District (CRD) received an award this week from Wood WORKS!, a national campaign to increase the use of wood in commercial, industrial and institutional construction. The City and CRD were recognized for their joint venture, the West Fraser Centre, for the use of wood in the building. Quesnel Mayor Bob Simpson said the award was a surprise, as there is no nomination process. …Wood was used in the new arena’s ceiling and mezzanine, as well as many other areas of construction. The concept for the new ‘tampere art museum’ in finland is inspired by one of the best and most famous local distinctions: wood. the nordic country is the largest producer of wood in europe and among the largest in the world. 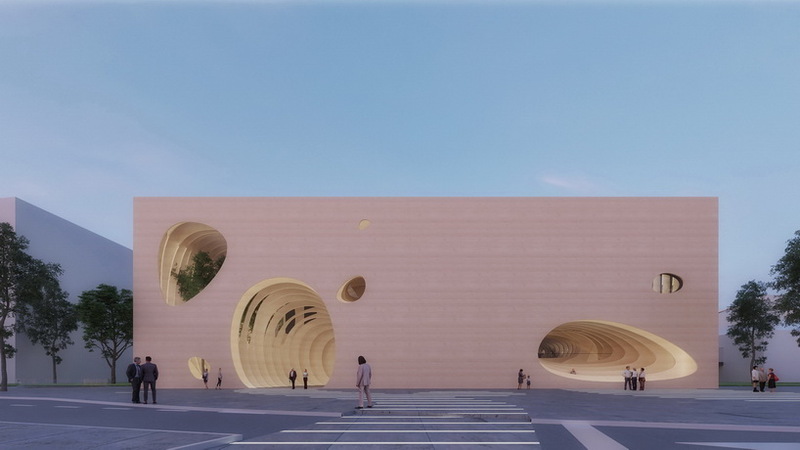 3GATTI’s proposal with its giant wooden blades would like to create an important landmark that can be easily remembered by the visitors and create a clear identity of the area. the architectural object will be very powerful because of its simplicity, but will also let perceive from the exterior its enormous interior complexity. in fact, those huge walls distant only 1.2 meters from each other will let filter inside not only the light but also the view and the pedestrian’s flow that will drain freely through the lateral slits. They just don’t make ’em like the Sakyamuni Pagoda anymore. Built from wood in 1056 in the Shanxi province of China, the building has remained standing to this day despite seven earthquakes rattling the region within its first 50 years of existence. Since then, it’s held up against a slew of seismic events, even when more modern structures have failed. Now thanks to recent advancements in timber technology, modern architects are rediscovering the benefits of working with wood. Wood was the go-to construction material from the dawn of time up until the late 19th century. …”When you compare a wood building with a concrete building, wood wins every time,” Jim Bowyer, an emeritus engineer at the University of Minnesota in St Paul, told Nature in May. Ottawa, ON — The Sustainable Forestry Initiative Inc. (SFI) announced the 2017 SFI Awards at the SFI Annual Conference. Craig Blair, President and CEO, Resource Management Service (RMS) LLC took home the SFI President’s Award. Craig is being recognized for providing the vision and strong leadership that helped Project Learning Tree (PLT) find a new home at SFI. J.D. Irving was the recipient of the SFI Leadership in Conservation Award recognizing SFI Program Participants across Canada and the U.S. who are involved in strong partnerships focused on conservation. Finally, the Maine SFI Implementation Committee was the winner of the 2017 SFI Implementation Committee Achievement Award, recognizing the exceptional work of the grassroots network of 34 SFI Implementation Committees across the U.S. and Canada. It’s hard to imagine a landscape that touches Canadians in as many diverse, important ways as our forests do. It’s equally difficult to think of another landscape that requires as much complex management. I recently participated in a briefing session of assistant deputy ministers involved in forests across Canada, and I can attest that the hard work, strong cooperation and broad engagement are the new normal. That’s because, more than just part of our environment and economy, Canadian forests are a way of life. And forest managers are collaborating across widespread geographies and integrating a broad range of disciplines to ensure forests remain strong and healthy for Canada’s next 150 years and beyond. This summer’s devastating forest fires that affected parts of the country from B.C. to Ontario are a stark reminder of how forests can affect our everyday lives. CALGARY – Christopher R. Mosher, CPA, CA, EP(CEA), Director of Audits and Chief Financial Officer for the Forest Practices Board, is the recipient of the inaugural 2017 ECO Impact Award in the Auditor Impact category. Chris was nominated for his work developing the Board’s field-based compliance audit program. “This award is really a recognition of the Forest Practices Board’s program and what staff and board members have accomplished over the past 21 years,” said Mosher. Chris has been an Environmental Professional (CEA) for 15 years, in addition to being a Chartered Professional Accountant. The ECO Impact Awards were established as part of ECO Canada’s 25th anniversary celebration. A National Forest Week event took place at McLean Mill for Grade 4/5 students in School District 70. More than 300 students got the opportunity to watch logging demonstrations, learn about stream riparian and fish discussion, wildfires and take part in a forestry nature walk. This event is a collaboration between the South Island Natural Resource District, BC Timber Sales, Island Timberlands, Western Forest Products, TimberWest, Alberni Community Forest, BC Wildlife Service, West Coast Aquatics, ADSS, Port Alberni Elementary Schools and Wickaninnish Community School. In Doug Hockley’s opinion piece from Sept. 15, he states, “‘Money doesn’t grow on trees’ doesn’t need to apply for the District of Sechelt. We still have a Community Forest that requires harvesting to keep it healthy for future generations.” The comment begs deeper analysis of the direct benefit that Sunshine Coast Community Forests (SCCF) – a logging company, actually – contributes to the long-term economic health of Sechelt. For every clear-cut forest heading off Coast on the back of a logging truck, there’s an associated loss of a natural asset. …The forests being logged by SCCF are not second-growth tree farms so are not being “harvested” – they are the last remnants of the natural forests at low elevations that once graced this coastline. With the Elephant Hill fire at 100 per cent containment and that ever-desired “under control” status as of Sept. 27, there are still firefighters on the lines working to do the final cleanup on the fire. The 100 Mile Free Press joined a tour to the front of the fire lines with other local media to see what firefighters are working on in what is hopefully the ending stages of the fire. … The crew is on their sixth deployment of the year, having started on the fire near Princeton working 26 hour shifts to keep it from entering the town. Seven BC Wildfire Service firefighters are working on the fire burning about two-kilometres southwest of Cawston. The fire is estimated at three hectares in size and is burning up slope in extremely steep terrain. Firefighters are building guard at the base of the fire. Hand-ignition operations are taking place to strengthen the guard, so an increase in smoke can be expected this afternoon. At this time, the fire does not pose a threat to public safety, structures or values. The Verdant Creek wildfire in Kootenay National Park and Assiniboine Provincial Park is no longer considered out of control. It’s not out by any means, but Parks Canada officials say recent cooler temperatures and precipitation allowed crews working directly on the fire’s edge to make significant progress. …The last estimate on the size of the fire was about 17,644 hectares – or 1,760 square kilometres. No new update on the size of the fire is being provided at this stage. The lightning-sparked Verdant Creek fire was first discovered on July 15. It completely burned down a backcountry warden cabin the following day as 70km/h winds spread the fire quickly. Wildsight’s Conservation Director John Bergenske claims there have been cases in the past where loggers tried to clear out a forested area after a heavy fire season and did so irresponsibly. …Bergenske adds that salvage logging can be beneficial to an area if done correctly, which is why his group is working closely the local forestry companies and the provincial government. …So far, he says it has been a very open, cooperative process that he hopes will be an example of industry and the environment working together for the benefits of all. Municipal politicians from B.C.’s Interior are appealing for more help from the provincial government to prevent wildfires from threatening their communities. From prescribed burns to legislative changes to allow clearing in old-growth forest areas, they expressed their concerns to representatives from the B.C. Wildfire Service at a panel hosted by the Union of B.C. Municipalities on Thursday. …“The scale caught everyone by surprise,” said Cariboo Regional District vice-chair John Massier, whose region was hard hit by this year’s fire season. Massier said there is a movement in favour of returning fire to the landscape in the form of prescribed burns. He said they work because areas that were burned 20 to 25 years ago were spared from fire this year. PORT ANGELES — Authorized timber harvest slash-burn fires will begin at two locations in Olympic National Forest west of Port Angeles after Sunday, when the statewide ban on outdoor burning that exempts recreational fires will be lifted, fire officials said Wednesday. But the ban could be extended in Clallam County if it doesn’t rain enough, Clallam County Fire District Chief Sam Phillips said Wednesday. And it’s already been extended beyond Oct. 1 until further notice in Jefferson County, East Jefferson Fire-Rescue Chief Gordon Pomeroy said Wednesday. “It’s all about the burnable fuels,” Pomeroy said. Your views are ill-informed, if not downright deceitful, as regards both the causes and solutions to the fire danger facing us here in Montana. Cutting down forests does not stop forest fires. In a time of ever-increasing heat indexes and drought, fire is inevitable in our forested areas. Logging only creates a damaged, barren landscape, and lines the pockets of the timber industry as they hack away the vital living forest, at the expense of the taxpayers and their beloved public lands. This depletes our beautiful forests, which are a critical component in the state’s major economy. A Ketchikan company has been awarded a $2.6-million sale of second-growth timber on an island in Southeast Alaska. The state of Alaska prepared and awarded the contract for logging on federal land on Kosciusko Island under an agreement with the federal government. 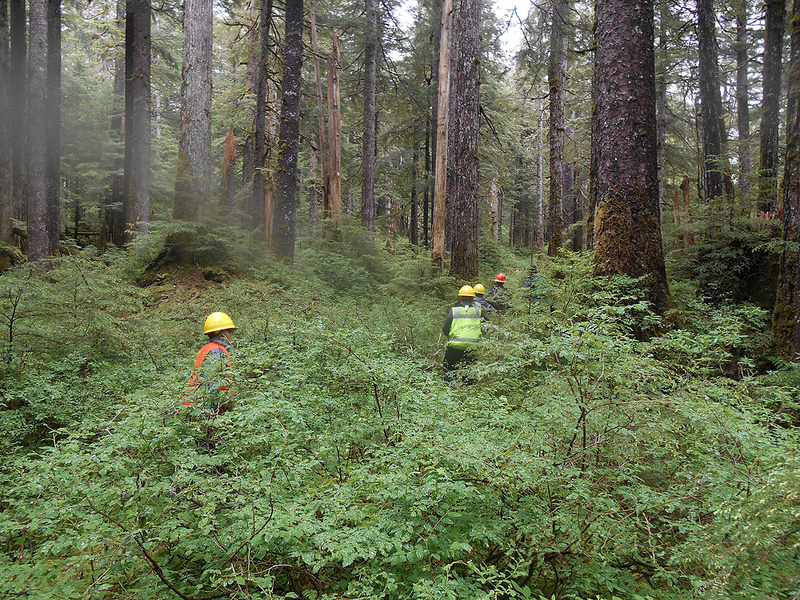 The sale is the first of its kind in Alaska under what’s called a good neighbor authority agreement, which allows the state’s Division of Forestry to handle sale preparation, administration and oversight for the logging on the Tongass National Forest. … “The benefit for the state government is helping the Forest Service with capacity issues and actually getting timber sales prepared quicker and out for sale,” said Chris Maisch, state forester and director of the Alaska Division of Forestry. As Montana’s historic summer wildfires smolder down, U.S. Sens. Jon Tester, D-Mont., and Steve Daines, R-Mont., are focused on future blazes. The two spent Wednesday testifying in support of the Litigation Relief for Forest Management Projects Act. …the Act aims to remove legal obstacles facing forest management projects ­— the logging and thinning operations that, they say, can remove fuel from fires’ path. …In particular, the bill addresses the outcome of a 2015 lawsuit, Cottonwood Environmental Law Center v. U.S. Forest Service. In that case, the 9th Circuit Court of Appeals ruled that the Forest Service had violated the Endangered Species Act by failing to re-enter consultation with the U.S. Fish and Wildlife Service. Whether it’s the destruction of rainforest shared by elephants and orangutans in Sumatra to produce palm oil; reports linking fast food giants to the burning of tropical forests in Brazil and Bolivia; or the hundreds of thousands of hectares of tree cover loss per year in West Africa – the world’s forests are being razed to sate global demand for produce such as palm oil, beef and cocoa. As of March 2017, 447 companies had made 760 commitments to curb forest destruction in supply chains linked to palm oil, soy, timber and pulp, and cattle – principal forest-risk commodities – according to NGO Forest Trends. But what does this mean? And why do deforestation scandals keep emerging? ..Around 70% of deforestation is linked to the production of agricultural commodities that end up in food products eaten around the world. Who are the winners of the Bio-Based Innovation Awards (Americas) 2017? 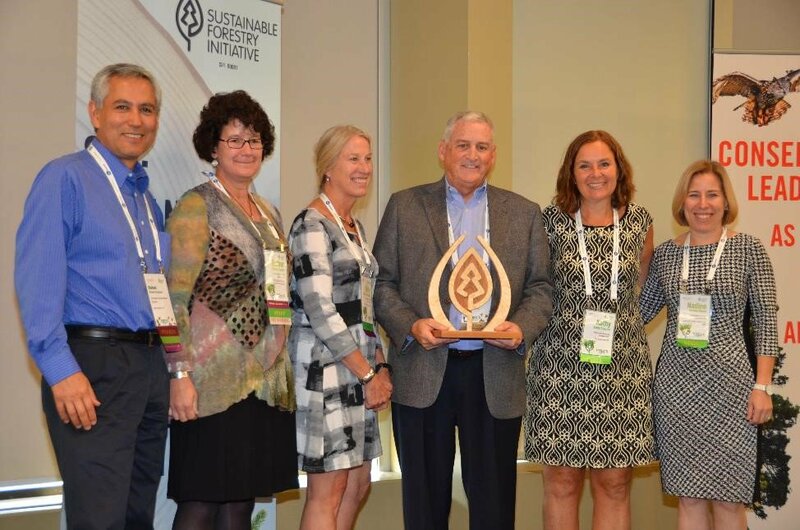 This week at the end of the first day of Bio-Based Live Americas in San Diego, the winners of the Bio-Based Innovation Awards (Americas) were announced. The winner of our Bio-Based Chemical Innovation of the Year (Americas) 2017 is ECOSYNTHETIX with their DuraBind™ Engineered Biopolymers – Sustainable Binders for Wood Composites Applications. Thee bio-based alternatives are an improvement on traditional binder systems which have been used for decades in the wood composites industry and offer higher productivity, less downtime, increased line speed, reduced panel sticking and improved panel quality and environmental benefits through the re-use of waste water. Southeast Alaska is a remote island chain, located about 1,100 kilometres north of Seattle, Wash. …Although the region is heavily forested…, there are no commercial wood pellet mills capable of supplying the region’s needs. …Thus, pellets for residential heating must be imported, often from Washington or Oregon. …we used life cycle assessment to evaluate the environmental impacts on global warming potential associated with converting home heating systems from heating oil to wood pellets in southeast Alaska. …Wood pellet use for residential heating in southeast Alaska was evaluated as a cradle-to-grave life cycle analysis. When comparing the global warming potential of pellets, locally produced cordwood, and heating oil, we found that global warming potential was lower for all scenarios that included wood pellet substitution. Minnesota utility regulators are studying a proposal by Xcel Energy to close two biomass plants that could mark a turning point for the industry here, particularly as prices for renewable energy drop. The proposal — which has approval by the state legislature and the communities affected — would close Benson Power, which burns turkey waste and wood, as well as a biomass plant in northern Minnesota owned by the Laurentian Energy Authority (LEA). Closing the two plants, which make up half of Minnesota’s biomass generation, could cost hundreds of jobs, and state forest management officials and the poultry industry say it will create turmoil among various suppliers to the plants. Their message is simple: slow down. LONDON – Tropical forests emit more carbon each year than all of the cars and trucks in the United States, scientists said on Thursday, calling for greater efforts to stem forest loss and damage. Almost 70 percent of tropical forest emissions are caused by degradation, a study in the journal Science said, measuring the less visible form of damage for the first time along with deforestation which has long been recognized as problematic. “These findings provide the world with a wakeup call on forests,” the study’s lead author, Alessandro Baccini, a scientist with the U.S.-based Woods Hole Research Center, said in a statement. The world’s tropical forests are so degraded they have become a source rather than a sink of carbon emissions, according to a new study that highlights the urgent need to protect and restore the Amazon and similar regions. Researchers found that forest areas in South America, Africa and Asia – which have until recently played a key role in absorbing greenhouse gases – are now releasing 425 teragrams of carbon annually, which is more than all the traffic in the United States. This is a far greater loss than previously thought and carries extra force because the data emerges from the most detailed examination of the topic ever undertaken. The authors say their findings – published in the journal Science on Thursday – should galvanise policymakers to take remedial action.